St. Patrick With St. Patrick's Day around the corner, it is worth taking a look at the story behind the man called St. Patrick. His whole life is celebrated by so many of us on 17th March each year throughout the British Isles and beyond. Kidsgen is happy to bring you the interesting background of a great man called St. Patrick, which you can go ahead and share with everyone you want. All you have to do is click on the REFER THIS PAGE link at the end of the page. Do send in your feedbacks if you think we have missed out something. 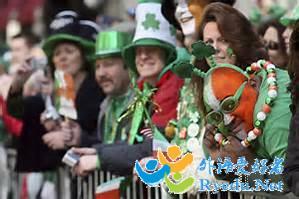 The person who became the great St. Patrick, the patron saint of Ireland, was born in Wales about AD 385. At the age of 16, he was sold into slavery by a group of Irish marauders that raided his village. His given name was Maewyn Succat. However, after he became a priest, he took on the name of Patrick or Patricus. Until he was 16 he considered himself a pagan and worked as a shepherd and turned to religion for solace. After six long years of slavery he escaped to the northern coast of Gaul where he studied in the monastery under St. Germain, bishop of Auxerre for a period of twelve years. It was in Gaul that, Maewyn became Patrick . During his training he began to realise that his purpose was to convert the pagans of Ireland to Christianity. His wishes were to return to Ireland to convert the native pagans to Christianity, but his superiors instead appointed St. Palladius. But two years later St. Palladius was transferred to Scotland, and Patrick, having adopted that Christian name earlier, was then appointed as second bishop to Ireland. Patrick was quite successful at winning converts, which led to clashes with the Celtic Druids. He was also arrested several times, but escaped each time. He traveled throughout Ireland, establishing monasteries across the country. He also set up schools and churches which would aid him in his conversion of the Irish country to Christianity. St. Patrick's mission in Ireland lasted for thirty years. After that time, Patrick retired to County Down. He died on March 17 in AD 461. That day has been commemorated as St. Patrick's Day ever since. Patrick raised people from the dead. He also is said to have given a sermon from a hilltop that drove all the snakes from Ireland. Of course, no snakes were ever native to Ireland, and some Christians claim that this is a metaphor for the conversion of the pagans.